Introduction:- With the awareness coming at all levels, today children with intellectual disability are well looked after and their life span has enhanced. Therefore many of such children outlive the life of parents thus leaving a very critical question behind “ WHAT AFTER PARENTS” and this question still remains unanswered specially in case of severe/profound cases where children are 100% dependent on caretaker. For moderate children with self help skills various institute have come up in our country but most of them are still hesitant to take on the challenge on severe/profound children. AASRA:- Ashadeep Society has taken a initiative in this direction and decided to open an institute which meets this requirement. AASRA (An alternate shelter residential area), which in English also means SUPPORT is a concept to provide a PERMANENT HOME to such children whose parents are no more there and they have nobody else to support the child. 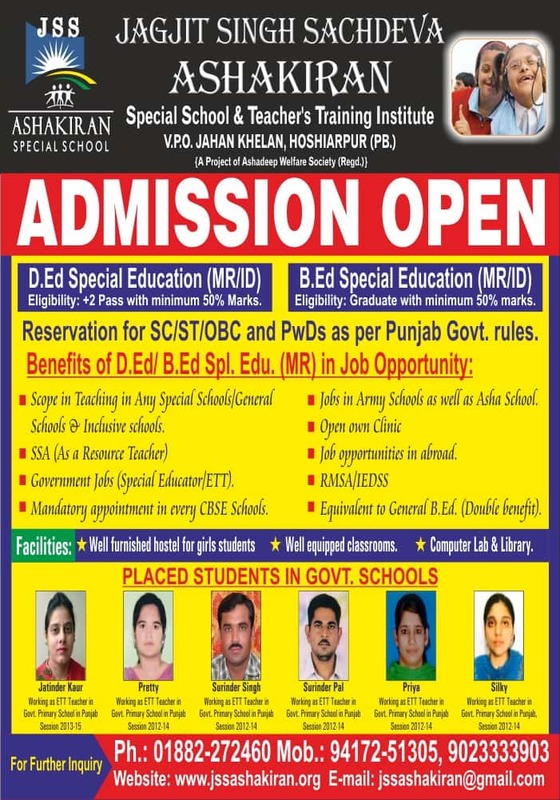 This project is basically an extension of JSS Asha Kiran Special School and is to be managed by ASHA DEEP WELFARE SOCIETY with the same governing body. However AASRA will have its separate management committee with ADWS as under. AIM: Aim of AASRA is to provide a permanent home for specially abled children including SEVERE/PROFOUND cases and take their life time responsibility till their last rites. Initial Targets: AASRA will initially be planned for 40 children with 25% as severe/profound category and 75% for moderate category I.e. 10+30 children. Severe children will be provided an independent room with attached toilet on twin sharing basis and moderate children will be provided a dormitory with attached toilets. Depending on the response/success, further expansion will be planned. Financial Effects: Parents will have to bear the initial share for cost of infrastructure for the child depending on the requirement i.e. Room v/s Dormitory. Approximately life time cost for severe child will be Rs 4 Lacs and for moderate child will be Rs 2 Lacs which will cater for provision of accommodation for life time and also its maintenance for life time. This will be deposited by parents at the time of registering the child with AASRA. A proper COURT AGREEMENT will be registered between AASRA and parents/guardians prior to acceptance of child. Donations:- We humbly request one and all to donate generously for this Nobel cause. All those donating room/dormitory/part of building, that part of building will be named after the donors as per their choice. How to donate: Donations can be made direct to by draft/cheque/bank transfers, in the name of society and not on any individual’s name. Please send your postal address to dispatch the receipt of the donations. Society has applied for acceptance of donations in foreign exchange under FCRA, and till the receipt of the donations in foreign exchange are not accepted. Conclusion Asha Deep Welfare Society has shown the courage to take on this project to provide life time support to such children after their parents. We cannot succeed in such Venture without the generous support of society to which you all belongs. Therefore we make an humble appeal to all to join us to make this project a success. All Donations are eligible for deduction u/s-80G of Income Tax Act. There should be no. hesitation in donating any small amount, as every penny from donor is valuable.